Excavation photographs: Bronze Age cist burial under excavation. Includes detailed views of skeleton and pottery vessel. See also NB13NW 13, Viking burials at NB 100 365. 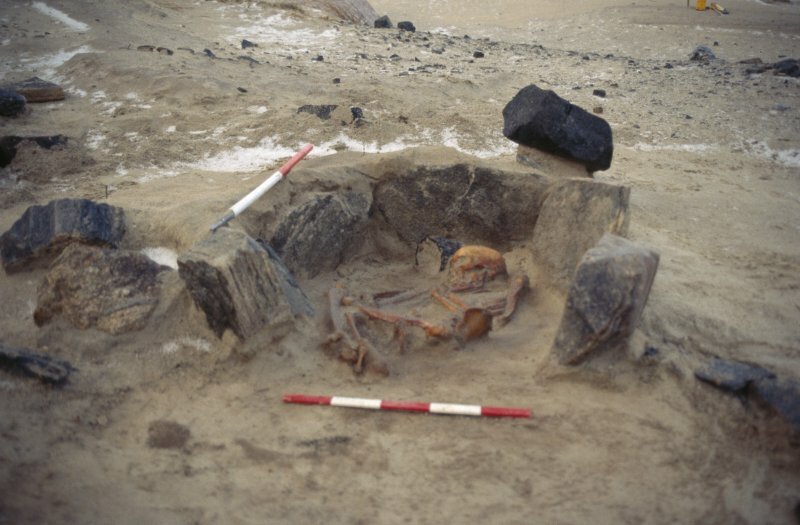 The excavation of a Bronze Age cist burial took place during fieldwork concentrated on the adjacent putative Norse burials, which lay c10m to its NW. Excavation revealed an orthostatic, slab-lined, sub-rectangular cist with maximal internal dimensions of 1.2m from E to W by 0.9m from N to S. This contained a well-preserved crouched adult inhumation. The skeleton was enveloped within a distinct stained sand, deriving from the decay of the soft body parts and/or textiles. An intact undecorated vessel lying beside the skull was the only gravegood present. An arc of stones immediately above the orthostats of the cist represents the basal course of a corbelled vault above the burial chamber. This suggests that the cist must have been situated within a now eroded mound. The cist had been inserted through the existing ground surface, a small patch of which was preserved on the N side of the cist. Elsewhere all sand deposits outside the cist are almost entirely scoured. A rough arc of boulders around 1.5m from the S and W of the cist may have delimited the extent of the mound. Archive and publication reports of fieldwork results are currently in preparation. In August 1994 two further Viking Age graves were excavated beside the three adult burials recorded in 1992 (supra). Further erosion within a deflation hollow on the SE slopes of Cnip headland had revealed human bones in an eroding sand face less than 1m W of the 1992 excavations. A bone pin, two amber beads and a small quantity of human bone were recovered by a representative of Historic Scotland during an initial site inspection. Subsequent excavation revealed a substantially eroded grave, comprising a rounded scoop filled by light brown sand, and containing an infant orientated NW-SE. Only the skull and upper left torso of the skeleton were preserved in situ. A single amber bead was recovered from beneath the jaw, suggesting that it had formed part of a necklace. During cleaning of areas of exposed ground surface contemporary with the Viking Age cemetery a second grave was located adjacent to that detailed above. Upon excavation, it contained an undisturbed flexed neonate inhumation orientated approximately E-W. A small lump of iron, as yet unidentified, was located beneath the rear of the skull. The burial lay within a rounded scoop measuring 0.66m E-W by 0.48m by up to 0.20m deep and containing a light brown sand fill. As with the other burial, no surface marking of the grave was evident. Cleaning of exposed areas of ground surface on a terrace up to 3.8m wide revealed no evidence for further graves within c 9m SW and c 6m NE of the excavated grave group. The burials excavated in 1992 and 1994 therefore appear to have formed a discrete cluster, possibly reflecting familial or kinship relationships. The grave group lay on a level patch of ground, and it is likely that the graves were deliberately sited on a terrace on the hillside. No evidence for any formal boundary to the cluster of graves was identified. Three other eroding features were examined during fieldwork. A cluster of stones c 1.5m across, located c 1m N of a multi-phase Bronze Age cairn excavated by J Close-Brooks in 1976 and 1978, had been identified as a possible cist roof. No structure was revealed within the stones; two pits at least 1m in diameter were partly revealed in the trench immediately to the E of this. The stones lay on a Bronze Age cultivated soil previously identified by Close-Brooks, indicating that the features were broadly contemporary with the adjacent cairn. A disturbed cobble hearth was identified c 15m NE of the calm. An irregular patch of dark grey sand lay adjacent to the hearth. Two iron objects, possibly tacks or rivets, a lump of iron slag, and several lumps of charcoal were recovered from this deposit. Approximately 40m SW of the Viking Age grave group an alignment of four stones orientated N-S, exposed within an erosion face over 1m high, was investigated. The stones lay within a layer of pale yellow sand immediately beneath the present turf horizon; the stones overlay a sequence of sand deposits. The date and function of the feature is unclear. A fifth stone, possibly part of a slumped upper course, partly overlay one of the stones, but no deposits abutted the stone alignment.